Just over a month ago I designed and printed personal business cards for my graduation exhibition. In fact, I ended up printing a few more cards than I needed, but that’s another story altogether. The design uses the coloured circular elements from my personal logo design, and the branding is consistent with my business website, printed portfolio and interactive-CV CD-Rom. 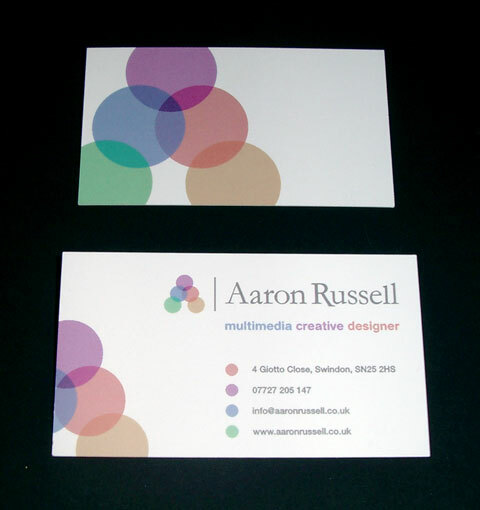 The cards are printed on a 400gsm silk stock and are ever so slightly narrower than a standard business card size. To be honest, I’m not sure I like the slightly unconventional size but it meant the cards fitted perfectly into my C-Shell CD cases whereas standard-sized cards would not have fit. I won’t mention who printed the cards because, frankly, I don’t think they’re worthy of a mention. As I alluded to earlier, I had a few problems with the printing. This was in part due to my inexperience (lesson learnt) but also the printers complete lack of customer service played its part too. They were an Internet-based printers with attractive prices, but in future I will be seeking to develop a relationship with a good local printer. Another lesson learnt! If anyone wants a card, drop me a line and I’ll happily pop one in the post to you.